The apartment (about 60 sqm) has a great sea view (port on the right, opposite the island of Mortorio, Soffi and Mortoriotto), bright and ventilated, furnished with care. The house has a bedroom with double bed, a bathroom with shower and a kitchen with oven (newly renovated) and a lounge with dining area and double sofa bed. The balcony has a seat overlooking the sea, i would suggest ideal for an intimate dinner. The house also has a parking space in front of the entrance (essential in Porto Rotondo). Nice apartment, location and price! Perfect location, apartment is comfortable,all you need to relax! Eine Ferienwohnung ideal zum Entspannen und Genießen! Die Angaben des Vermieters sind voll zu bestätigen, darüberhinaus empfindet man den Blick vom Wohnzimmer bzw. Balkon auf das Meer noch viel imposanter als es die Onlinephotos zu zeigen vermögen. Die Wohnung ist gepflegt und sauber, gewinnt durch das persönlich gestaltete Interieur der Wohnung. Zum Wohlfühlen! In einer ruhigen, gepflegten Anlage gelegen, sind viele Aktivitäten fußläufig erreichbar: Bummeln und Shoppen in Porto Rotondo mit viel Hafenflair, Restaurants und ein Supermarkt. Ein kleiner Strand ist fußläufig erreichbar. 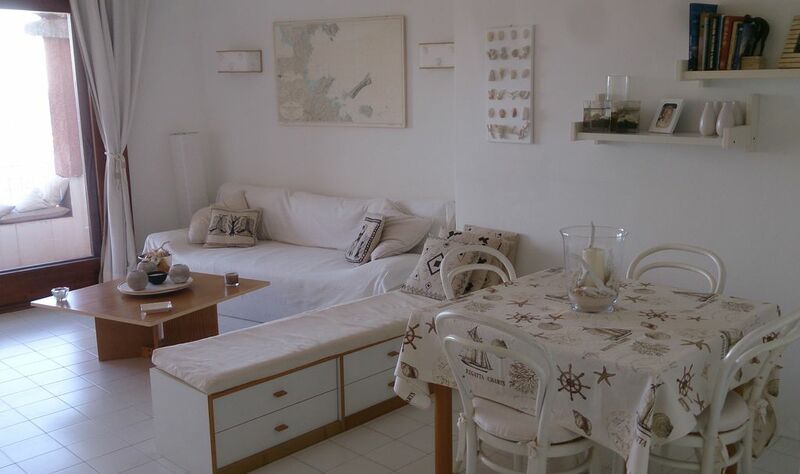 The house is 5 minutes walk from the port, the nearest supermarket is 5 minutes away, as the bus stop. All easily reached by foot. Porto Rotondo is located about 15-20 minutes from the airport / port of Olbia. In the summer period (June-September) The town also makes available a free shuttle that can take you to many of the surrounding beaches, with departures every 30 minutes.